The St. Matthew’s pool is a valuable resource used and enjoyed by multiple St. Matthew’s Parish and School groups and organizations. The Conditional Use Permit governing the Parish and School property does not allow our facilities, including the pool, to be rented to outside groups. Use of the pool is limited to programs operating under the ministries of the Parish of St. Matthew. Constituents wishing to use the pool for a program or event must be approved in advance by Upper School Principal Bruce Harlan, and then scheduled by Mark Mendoza. Use the online St. Matthew’s Pool Request Form to start the process of requesting and scheduling. Any use of the pool involving swimmers under the age of 18 requires a minimum of two (certified) lifeguards. Once the pool reaches a capacity of 50 swimmers, a lifeguard should be added for every additional 25 swimmers. Groups of 20 swimmers or fewer require a minimum of one certified lifeguard and at least one competent adult dedicated to assisting the lifeguard. Groups larger than 20 swimmers require at least two certified lifeguards. No one is allowed in the pool or on the pool deck unless a lifeguard is on duty. Lifeguards have final authority to enforce all rules of the pool. Certified lifeguards must be approved by the School and have copies of their certifications on file with the School. For events where outside lifeguards are hired, the School must approve the agency or the individual lifeguard(s) prior to the event. Adult swimming groups need at least one lifeguard present, however, all adults use the pool with the understanding that they do so at their own risk. A waiver must be signed and on-file for each adult using the pool. Copies of the waiver are available from Bruce Harlan. ● Slipping on the pool deck, tile surfaces, and wet surfaces. ● Trauma due to diving or jumping including impact with the water surface, other swimmers, the bottom of the pool, lane lines, or other objects. ● Infection and illness due to germs in the water or on the deck surfaces. Clergy, personnel and their families who reside on the Parish property can use the pool without a lifeguard, but they do so at their own risk. The School reserves the right to evaluate user behavior and respond accordingly, including removal of persons from pool or facility and suspension from future use. In accordance with the National Lightning Safety Institute, the pool facility should be cleared when thunder is heard or lightning is seen. It will remain closed until no thunder or lightning has been detected for 30 consecutive minutes. We ask all patrons to completely clear the pool deck due to the inherent danger. Swimming under or near pool covers is prohibited. Any group or program using the pool is expected to care for the facility and pool equipment. It is expected that the pool will be left in good condition, including the removal of lost and found items, trash picked up, and equipment put away. 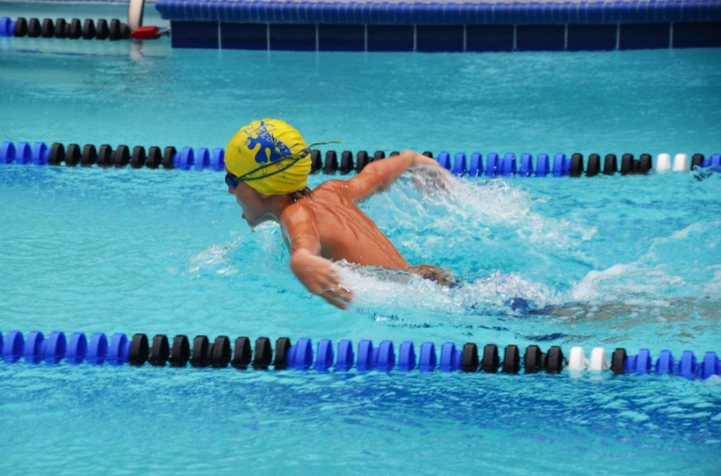 Lane lines are not to be removed from or installed in the Pool or pool area without prior permission. Swimmers should never sit or climb on lane lines. Groups using the pool are financially responsible for any damage to the lane lines or other equipment. No glass containers or other glass items. The Director of Facilities is responsible for monitoring water quality. He or she has full authority to close the pool if testing or other data indicate a potential hazard. The Director of Facilities will inform the School of any issues with water quality or safety.